Being in airports I keep my antennas up for interesting people and ways to witness for Christ. If I see a priest in collar or a nun in habit I drop my luggage, run over and thank them profusely for serving the Church. I got up and walked over. I said, “Hello sir. Does that hat say you served our military?” For the next ten minutes Janet and I heard a remarkable story. Eighty-seven year old George Taylor was on his way to Washington to receive the Congressional Gold Medal for serving as a Marine in the Pacific arena in WWII. 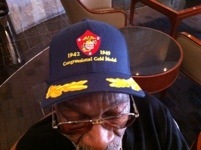 He was in the FIRST Black Marine Corps. He told us how tough it was in racist America at the time and he recounted stories of their times in war. I announced to everyone sitting nearby that they were in the presence of a hero. (Hat says “1942-1947, Congressional Gold Medal) Beyond his military service he worked hard afterwards, even though he only had an 8th grade education. He worked his way up until he eventually built a house next to the mayor and all of his kids have impressive degrees with enviable careers. He is a genuine American success story. 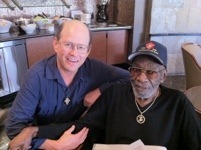 Before I left I said, “I bet you are a Christian too, aren’t you?” he responded, “Yes sir, and I go to church.” he smiled when I told him I’d put his story and pictures on my website – and watch to see him on the news. We see some of our best and worst movies while flying in airplanes back-and-forth across the Atlantic. Today we saw one of our dumbest movies which started out intriguing but we both said it’s on the lower end of all the movies we’ve watched. 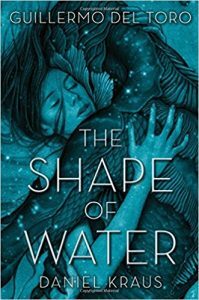 It was called “The Shape of Water“. It was about a Man-like sea creature (humanoid amphibian) taken into captivity. A number of times it was discussed whether this amphibious creature was a god and it did have powers of healing..
A woman befriends it and helps it escape from a government laboratory. She falls in love with it (him). They even have sexual relations before the ending where the end up in the ocean where she grows gills and they live happily ever after together below the sea. 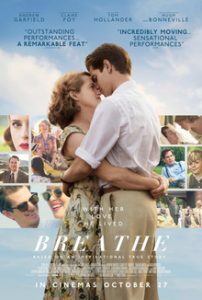 But the movie I mainly wanted to discuss was “Breathe” which is a tragic polio case based on the actual life of a Britishman named Robin Cavendish (played by Andrew Garfield). His wife (played by Claire Foy) loves him deeply and devoted her life to his surviving and living his life to the fullest possible. 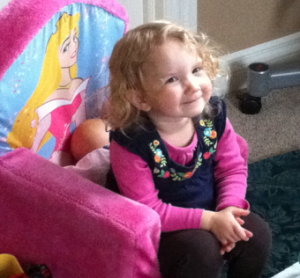 Together they help other handicapped people and invent machines and chairs to help others who are incapacitated. But is soon as I pushed “play” again my wife and I (watching it together as we always do on planes) realized this movie was taking a turn for the worst. He decided he would end his life after many courageous and exemplary years of helping other people, loving his wife and son, and traveling even with his disability. He decides it’s time to die because he doesn’t want to die naturally in front of his wife and his older son. There’s a big party with all of his friends and family to celebrate his choice where they tell him upgrade to see is to end his own life. After he sends everybody away he dies by lethal injection. It was a hugely disappointing end to what could’ve been a beautiful story. Even though it claims to be based on a real story and that the actual man was an atheist, I could not confirm that he actually took his own life in real life. But that’s maybe because I’m still on the plane with limited resources. I wrote back to my friends immediately the following, “Opps! Looks like I spoke too soon. I sent the e-mail 2/3rds of the way into the movie when Janet and I had tears in our eyes because of the beauty of the relationship And the family supporting and helping him. It could have been such a great movie. “But in the end he decides to kill himself and his wife who has loved him all through and been there in love with him accepts this and they help him kill him self. What a disaster! Catholic Answers just posted a wonderful, theological and Catholic view of “end-of-life issues.” You can read it here.